In spite of the passing away of the nationally famous sake masterbrewer, Mr Hase, his apprentices have taken up the job of continuing producing brews in the greatest Noto tradition (Noto peninsula in Ishikawa Prefecture) at Doi Brewery in Kakaegawa City and helped maintain the highest rank for the pleasure of all. Bitter choclate appearing later with more food. Overall: Very elgant and discreet. Complex. Suited for ladies especially. When the Japanese Government boosted the Sake in dustry in 1953 by offerings generous loans and tax rebates, they included an unwritten condition that Breweries produce sake to be consumed as early as possible, effectively stifling the research and developments of “vintage” and old-style sake. Doi Brewery has come up with a particularly interesting brew called “Junmai Ginjo Ju Nen Koshu” (Ten year old junmai ginjo) made from rice milled down to 55%. 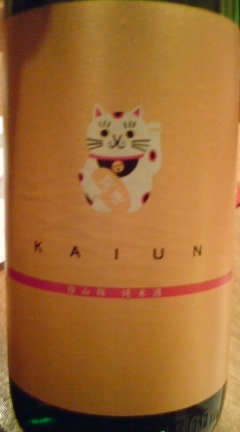 Apart of the beautiful old fashion label, it drwas a 17~18% alcohol content, making pretty strong. The colour is a radiant gold, almost the same colour as the label. 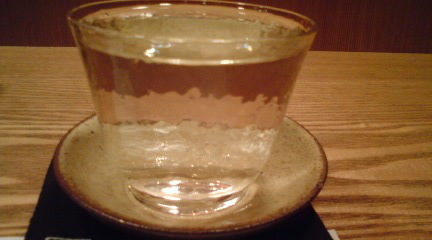 For unknowing people its taste reminds of old Chinese rice wine. It could be drunk at room temperature or warmed up as “kan”. It is a bit of an acquired taste, but wine fans will be able to appreciate for its great value. I would definitely recomend it with some hearty food.